Square Enix fans have a patience I could never muster. During a fiscal year presentation, Square Enix CEO and president Yosuke Matsuda, detailed the company’s plan for the next few years. 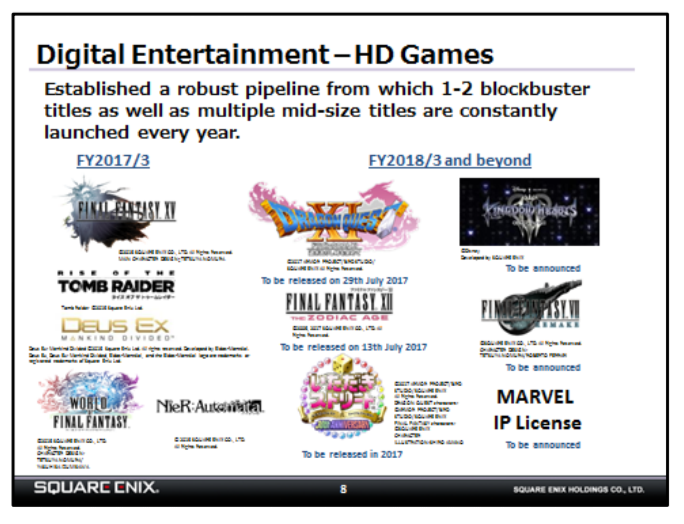 He is quoted as saying we will see both games “in the next three years or so” when the slide below was displayed, it was shown that the much hyped over Kingdom Hearts III and the nostalgia driven Final Fantasy VII remake will be seen post 2017, as first reported by Gematsu and visable later on copies of the presentation made public. This will come as shocking news to fans as Kingdom Hearts was being hinted at a release set for this year or the start of next year. This new release scheldule means they might have to wait til 2020. But this does set to remind us that a Marvel based Square Enix game is due as well!